I can’t say I love pork as much as Anthony Bourdain does, but man I really do love pork. Let’s be real, he’s a professional and I’m an amateur; he can appreciate the pork on many more levels and I can. But nonetheless I can always enjoy perfectly tender pork shoulders, salty bacon, or crispy pork belly. This time though, we’re talking about pork chops. The home classic. This is one of those things where it’s really easy to make, but really easy to mess up if you’re not careful. 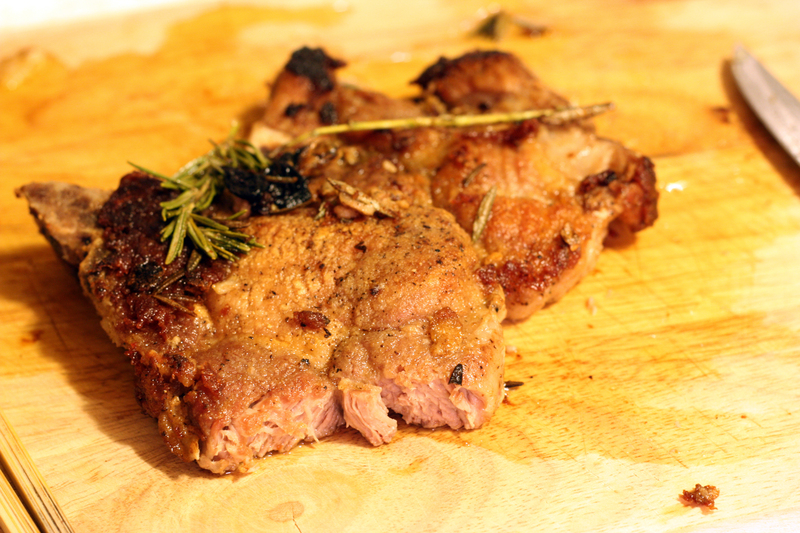 We’re talking about cooking a good slab of meat here so treat it like one! Prep the potatoes, the small size Yukon Yellows (not fingerling though), by boiling them in salted water for 10 or 15 minutes. Drain and let sit to dry. Salt and pepper your pork chops, and then dust them with flower. You can add any additions seasonings you want. But that’s it! I find one of the most useful things for pan searing a steak is that it should be around room temperature -ish. So that means try to have the steaks out while you’re prepping everything else. Now on a medium high pan, add olive oil to coat the pan and place the chops in. Just leave it for a couple of minutes. Then check to see how it is progressing, and flip when golden brown. If you don’t like pink pork, drop the heat to medium low. Add in like a quarter of a stick of butter, 2 sprigs of rosemary, and 3 cloves of garlic, crushed but whole. Now just take a spoon and baste the pork with the herb infused butter for about 3 more minutes. Don’t worry, that butter is just flavoring, you aren’t actually eating a quarter of a stick of butter. Then once the chops are firm but tender to the touch, remove and let rest. Remove the rosemary from the pan (so it won’t burn). Add a little more olive oil if necessary and now half the potatoes and place them flat side down in the same pan. Fry them up until crisp on the side and season with salt and pepper. And there you have it. The steps are simple, but there are some details that really make a difference. Give it a go and enjoy! 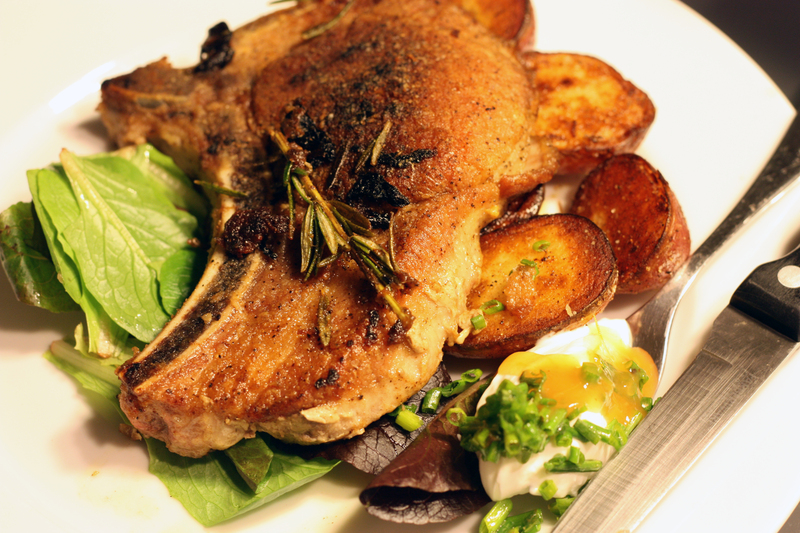 This entry was posted on March 7, 2012 by rrfoods in Dinner, Redmeat and tagged garlic, pork chops, potatoes, rosemary.